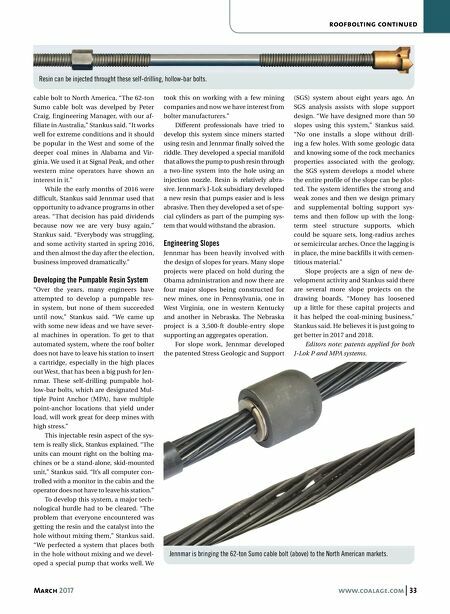 32 www.coalage.com March 2017 roofbolting Jennmar Solves the Pumpable Resin Riddle New automated resin injection system should improve safety for operators in weak ground conditions by steve fiscor, editor-in-chief The ground control specialists at Jennmar have made a major breakthrough. For the last two years, they have been working on a system that will allow an operator to pump resin into the hole from his cabin before he spins the bolt, eliminating the use of traditional resin cartridges. The benefits for the system would be twofold: the bolting machine operator remains in a safe position when the machine is likely in the riskiest location and the automa- tion function will only further enhance productivity. Similar to others in the mining indus- try, Jennmar saw activity decrease sub- stantially in the first half of last year. They opted to use that time to advance some of the projects they had on the drawing board and to reinforce sound ground con- trol principles to an industry fraught with turnover. "We have been working with both the mines and the regulatory agen- cies as far as roof control training pro- grams," said Dr. John Stankus, president, Keystone Mining Service, the engineering affiliate of Jennmar. "On top of that, our ground control engineering group has been incredibly busy since the election. Idled mines are reopening and that re- quires rehab activity with steel supports." Jennmar makes various steel supports at its Virginia facility, and one of the more popular products is its impact-resistant steel sets for supporting roof fall cavities. As far as new products and equip- ment, Jennmar has developed a self-drill- ing, injectable hollow-bar bolt for yielding ground. 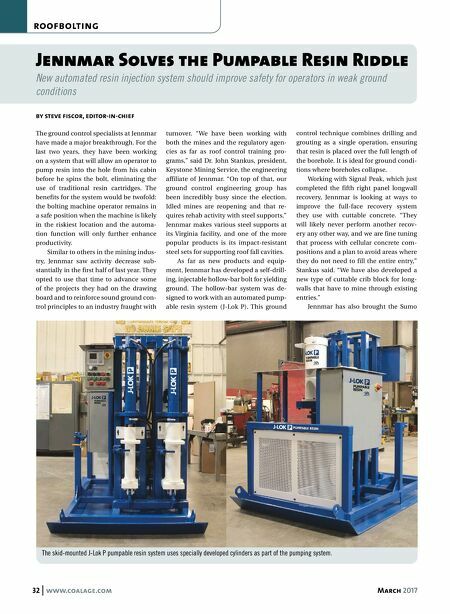 The hollow-bar system was de- signed to work with an automated pump- able resin system ( J-Lok P). This ground control technique combines drilling and grouting as a single operation, ensuring that resin is placed over the full length of the borehole. It is ideal for ground condi- tions where boreholes collapse. Working with Signal Peak, which just completed the fifth right panel longwall recovery, Jennmar is looking at ways to improve the full-face recovery system they use with cuttable concrete. "They will likely never perform another recov- ery any other way, and we are fine tuning that process with cellular concrete com- positions and a plan to avoid areas where they do not need to fill the entire entry," Stankus said. "We have also developed a new type of cuttable crib block for long- walls that have to mine through existing entries." Jennmar has also brought the Sumo The skid-mounted J-Lok P pumpable resin system uses specially developed cylinders as part of the pumping system.